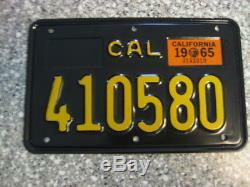 1963 California Motorcycle License Plate, include the original 1965 Validation Sticker, Original, correct for a 1965 Motorcycle, DMV issued the numbers"41" in 1965. Sticker is in mint unused condition, sticker is required by DMV to reassign plate to a 1965 motorcycle. Plate is in mint unused condition, no rust, no additional holes, or tears. DMV Clear Guaranteed, clear on 6/1/17, plate is ready to be reassign to a 1965 motorcycle. I will provide DMV forms required. If you do not see what you are looking for, text or call, I do have other auctions. Any question text or call Rudy to 323 394 9464. 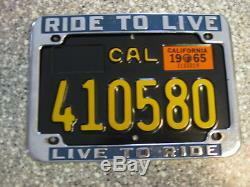 The item "1963 California Motorcycle License Plate, 1965 Validation, DMV Clear Guaranteed" is in sale since Thursday, June 01, 2017. This item is in the category "Collectibles\Transportation\Automobilia\License Plates\US\ California". The seller is "spiderm56" and is located in Ontario, California.